Growing Up Fast tells the life stories of six teen mothers from Pittsfield, Massachusetts, a post-industrial city in Berkshire County that was until the late 1980s, a manufacturing base for the General Electric Company. It documents the lives of these teenagers, their families and members of the community, as they witness factory closings and the transformation of their hometown under the strain of economic and social upheaval and the influx of drugs. "In nearly 400 fast-paced pages of wonderfully evocative prose, much of it in the words of her six subjects, all teen mothers, Lipper has actually conveyed the social and personal history of a growing class of Americans for whom there is little help and less hope. But this class of people has inner lives, and this is what Lipper is so deft at communicating...Lipper has mastered all of the relevant data. She has also mastered the scholarship on teens, on teen families, on children of these families, on the families from which these mothers come. Lipper is not only a filmmaker and writer. She is a photographer, and the book's chapters are interspersed with probingly gentle photographs of the dramatis personae." "Lipper builds a detailed case against the systems -- schools, welfare, the Department of Social Services -- that repeatedly fail these girls." "This book should be mandatory reading in middle school, for as the young mothers themselves explain, had they known what they were getting into, they never would have walked this path." "Compelling and important...this book adroitly illuminates a social crisis." "This deserves a spot on the shelf near Robert Coles' similarly accessible investigations of contemporary social issues." "There is nothing like the excitement of cracking open a new book, discovering talent, stumbling onto a fresh idea. It's what keeps us alert, trolling the endless shelves... Growing Up Fast, the story of six teen mothers in a burnt-out rust-belt city (originally the subject of a documentary) reveals much about welfare reform, domestic violence, and the state of public education." "What makes Lipper's book a page-turner is how intimate and detailed the stories are. Whether it's attributable to an interviewing skill of Lipper's or the openness of the young mothers, they've held little back. Growing Up Fast is a fascinating and deeply personal look into a part of our world that many of us choose not to see." "....extraordinary reporting... clear, insightful prose.... Growing Up Fast succeeds because of the author's evident respect for her subjects." "Growing Up Fast is readably written from the perspective of someone not much older than the young women profiled. Lipper writes with compassion and insight, is not judgmental, and accentuates her subjects' strengths... I would recommend this book not only for health care professionals taking care of adolescent girls but possibly to teenagers themselves, so that they can read firsthand the struggles of these young parents." Joanna Lipper first met Amy, Shayla, Jessica, Colleen, Liz, and Sheri back in 1999, when they were all enrolled at the Teen Parent Program. Making a short documentary film was only the beginning of an extraordinary journey that continued for four years as Lipper videotaped and interviewed the girls, their families, and the fathers of their babies. This raw material was the basis for Growing Up Fast. Often masked by statistics, demonized by the media, and stereotyped by people of all political persuasions, the voices and stories of these teen parents reveal the complex, disturbing, and often painful reality behind a vast array of social issues including welfare reform, low wages, drugs, domestic and dating violence, the prevalence of child abuse, and the role of education. In the tradition of The Corner and Studs Terkel’s Working, Growing Up Fast is a landmark work of empathy that will speak powerfully to parents, teachers, social workers, policy-makers, doctors, psychologists, policemen, lawyers, and teenagers. "Writing in the tradition of Winesburg, Ohio, Joanna Lipper takes us into Pittsfield, Massachusetts. Growing Up Fast is an astonishing book combining arresting portraits of mothers and fathers who are themselves children with a devastating depiction of a community living on the edge of economic despair." Growing Up Fast is a haunting testament to the vast, unfinished business of the abandonment of the working class and the resulting trauma that continues destroying lives. Joanna Lipper takes on the hard task of really listening to the young women who carry on, and she honors their predicament by rigorously setting out the complex context of their lives. This is necessary, enraging work. We're very lucky to have it." "Lipper's book works as a literary representation of the film 8 Mile. Like the hit movie, Lipper's investigation of the young working-class in a burnt out, post-industrial, rust belt city, portrays lives of not so quiet desperation." "America has been waiting for Growing Up Fast for too long...In telling the stories of Jessica, Shayla, Amy, Sheri, Liz and Colleen so sensitively, and often in the voices of the girls themselves, their families, friends and partners, this landmark work of empathy and of oral history reads like a nineteenth century novel of young women burdened by fates they did not choose. Everyone who works with young people and children should read this book; so should policy makers; so should parents; so should young people themselves." This book was inspired by Joanna Lipper's documentary, Growing Up Fast. The images below are available for download (click thumbnail to download). Each image is high resolution (at least 7 inches tall at 300 DPI) and is compressed as a .zip file. To uncompress, use WinZip or other similar application. Growing up Fast is available at your local Amazon and Barnes & Noble. 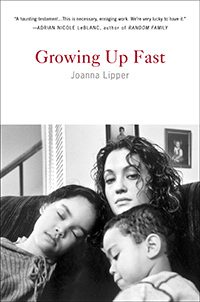 Joanna Lipper's film Growing Up Fast is available through Films for the Humanities & Sciences.